A combination of summer heat (I don't have air conditioning at home, and my main windows face west) and a suddenly active again auto-immune disorder (aka The Evil) has impacted on how much sewing (and other real life things) I've been able to do this year. The first is beyond my control, and the second is a bit demoralising. I planned to head up to the Roaring 20s & all that Jazz festival last Saturday in a fancy new 1920s dress, and got very close to finishing the dress before another bout of The Evil flared up. Instead of going to the Charleston Challenge, high tea and visiting a pub with a dixie jazz band, I went straight for the high tea in 1930s clothes. 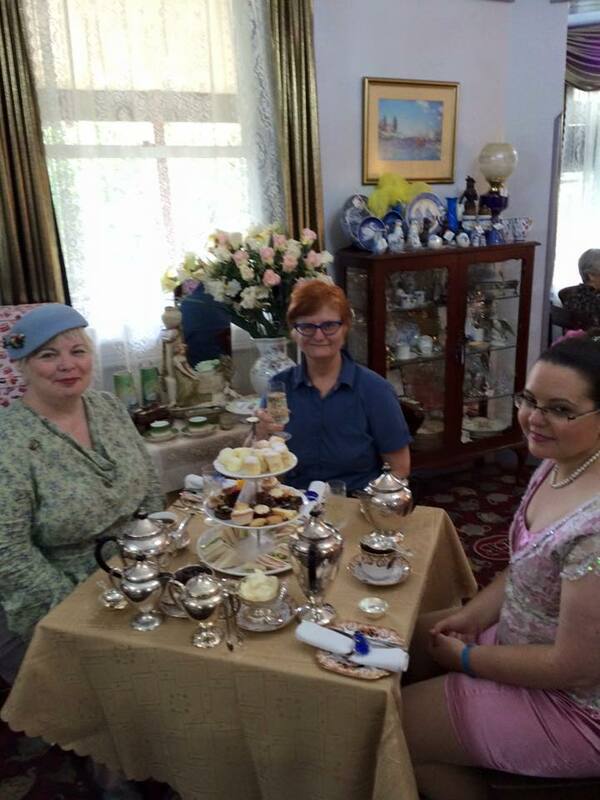 Nothing like wearing a pretty hat and fun with friends to feel better about yourself. Bygone Beauties were even able to have a variety of gluten/dairy free treats for me. I still want to finish the 20s dress this month as there's a historic dress picnic in early March. A fresh deadline means it won't hang around to become yet another UFO. I thought I had some photos of progress on my UFO and January dresses but the only thing on my camera is this adapted sleeve for my Lilly Rose UFO. I eyeballed the extra for a small puff at the top of the sleeve, as I'm fairly sure it's what I did with my first dress in this pattern. Hoping to finish that dress this weekend as the flare-up seems to be over. You look gorgeous in your hat Wendy, if only there was occasion to wear on every day! I am also without air conditioning in our weatherboard house so I feel your pain, I am so looking forward to some cooler weather too.